The Leadership Team is responsible for listening to, interpreting and guiding the life of the congregation, to an effective expression of our charism. In addition, the Congregation Leadership Team oversees the general administration and Trustee responsibilities of the Congregation. In their task they are assisted by Mrs. Bridget Cullen, PA to the Leadership Team, Sister Catherine Collins, Treasurer General and Trustee, Mrs. Nicola Wells, Finance Manager and Mr. Kevin Ruxton, Administrator. The present Congregation Leadership Team began their six-year term of office in August, 2014. 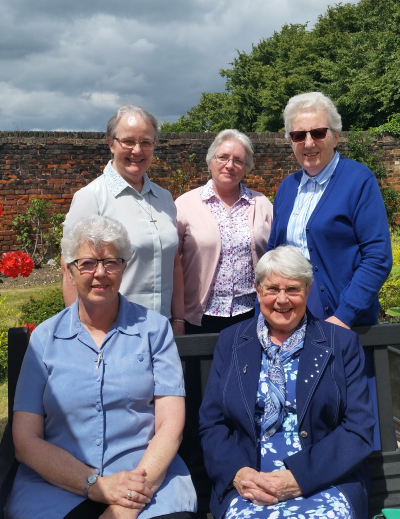 Sister Mary Mangan serves as the Congregational Leader with Sister Lorna Walsh, Sister Eileen McLoughlin, Sister Angelo Roncalli and Sister Mary Ita as General Councillors.